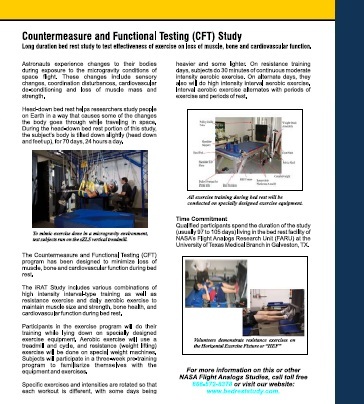 The new CFT study began at NASA in the summer of 2011, and is still actively seeking healthy volunteers. See the sZLS or "Standalone Zero-Gravity Locomotion Simulator" in action, and read about the on the full study details on the HTSF Web Site. This amazing "Vertical Treadmill" is the Earth analog version of the infamous COLBERT Treadmill on the International Space Station. Another major feature of the new study is the Horizontal Exercise Fixture (HEF), which provides resistance training. More resources, photographs and videos are available on the Information Sheet to the left if you think you might be interested in joining this study. Click for the full PDF! Participants must undergo a detailed screening process and if invited into the program, are eligible to make $160 per day for the duration of any study. 2 0 0 9 - WIRED Science : Do You Have the Right Stuff to Be a NASA Pillownaut?